A perfect tea gift idea for tea lover’s including a pretty Green & White Ceramic Teapot with aremovable basket to brew loose teas or the basket can be removed to brew tea bags. Included are Gourmet Teas, Biringer Tea Cookies, Chukar Chocolate Covered Cherries and a Seattle Chocolate Co. Truffle Bar. 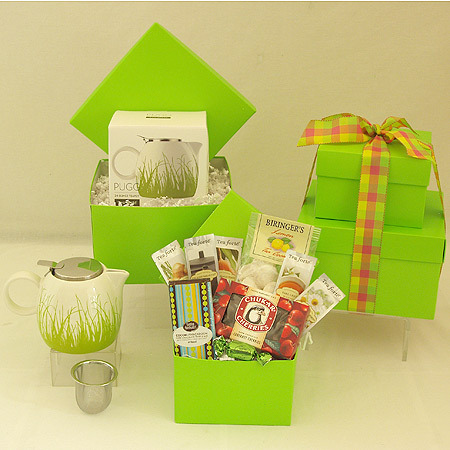 Arranged as a tower in two green stacked gift boxes, this cheery tea gift basket idea is a great Mother’s Day gift, get well gift, sympathy gift, housewarming present, birthday gift or for any occasion to pamper her and show you care!